Sprawling between the Krishna and the Tungabhadra rivers, Raichur is a beautiful city with historical monuments and picnic spots. Despite being the fact that it houses several beautiful tourist attractions, it is one of the least-explored cities in Karnataka. Do you know Raichur has a history dating back to the period before the Common Era? Yes, and the presence of Ashoka's rock edits in its surrounding regions prove the fact. Even though it is a historical town and most of the attractions here include ancient sites and monuments, it is still a wonderful getaway for nature lovers and photographers. On the outskirts of the city, you can witness beautiful hills and lush vegetation. Raichur is also home to a beautiful lake. So, what do you think about taking a break from Hyderabad and savouring the beauty of Raichur this weekend? Read on to know more about Raichur and how to reach it. Raichur lies in a belt of extreme type of climate, and therefore it is advisable to avoid visiting it during the summers when the temperature rises above the mean level. The best time when the beauty of Raichur is at its peak is from November until the end of March. By Air: As Hyderabad has the nearest airport to Raichur, you can't reach it by air if you are starting your journey at Hyderabad itself. By Rail: Raichur has well connected system of rail. Hence, you can catch a direct train from Hyderabad to Raichur. This rail journey will take an average time of 5 h.
By Road: Being one of the significant cities in Karnataka, Raichur has a good road connectivity and is easily accessible by road. As route 1 is the fastest and more comfortable, it is preferred by most of the tourists. Through route 1, you can reach your destination within 5 h, i.e., 1 h lesser in comparison to the other route. On your way, do not forget to take a break at Mahbubnagar and enjoy its beautiful attractions. Mahbubnagar is located at a distance of about 102 km from Hyderabad and 109 km from Raichur and is generally famous amongst locals for Pillalamarri, the 700-year-old banyan tree. Over a period of time, the region around this age-old tree has become a weekend stoppage for picnickers. One can also visit the nearby Deer Park which is immensely popular amongst children. Don't you think the beauty of a 700-year-old tree would charm you? Raichur is located at a distance of about 215 km from Hyderabad and must be visited by every traveller who loves taking offbeat trails. As it is mostly visited by locals and seasonal tourists, you can comfortably explore its beauty without any disturbance. Following listed are the most prominent places which can be explored in and around Raichur. Most Read: Tilmati - The Black Sand Beach In Karnataka! The invaluable splendour of Raichur, Raichur Fort is located atop a rock hill and overlooks the settlements of the city. It is said to have been built during the reign of the Kakatiya dynasty. However, the fortifications are said to have been in existence since the period of the Badami Chalukyas. Today, the fort is lying in ruins and is only visited by a few history lovers and locals. 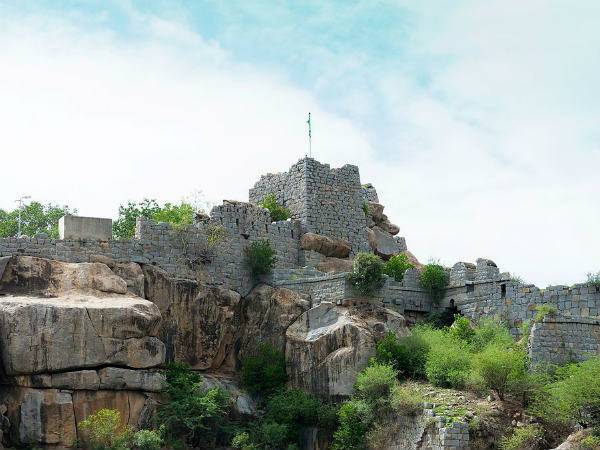 You must catch a glimpse of this majestic fort if you would love to learn in detail about the history of Raichur. Built in the Persian style of architecture, Ek Minar Masjid is a two-storey minaret with a winding staircase and is a must-visit destination for every architecture enthusiasts. It is one of the unique structures built in the region. Even though Maski is located at a distance of about 85 km from Raichur, it certainly deserves to be visited by every tourist and traveller. Being an archaeological site, it is the place where you witness the rock edicts of Ashoka. The town is located on the banks of Maski river and is also home to a few beautiful temples. The presence of hills and lush vegetation make its a lovely getaway. Most Read: These Destinations In Karnataka Are Heaven For Trekkers! If you would love to take a break from the hustling and bustling of Raichur, then do visit this beautiful lake where you can take a breath of fresh air and enjoy a serene atmosphere. You can find numerous locals coming here for jogging, walking and relaxing at the time of dawn and dusk. If you are in need of an unpolluted environment, then Aam Talab Lake is all at your service.